About the middle of the 19th Century a man known as ‘Doggy’ Lawrence was breeding small red terriers (about 4kg) that he sold mainly to Cambridge undergraduates. It is believed these dogs were the foundation of what are now known as Norwich and Norfolk Terriers. 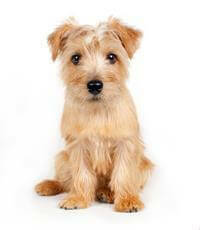 Norwich Terriers, drop-eared and prick-eared were officially recognised by the English Kennel Club in 1932. Following later disagreements, several representations made to separate the breed officially into two varieties were refused, but a suggestion to form two separate breeds was agreed by the club, with the prick-ears to be Norwich Terriers, while the drop-ears would form the new breed to be known as Norfolk Terriers. The breed is suitable for families, for young and old alike for small or large yards. The Norfolk Terrier is a fine family dog, a real presence in the house.